Plastic sets are ignored by most collectors. I think that is unjustified. BCC sets in Xylonite, or the wooden with Xylonite knight heads, are very collectable. Unfortunately I do not have it in my collection. Bakelite disc sets, like "The Services Set", can be found in Symbols and figurines page. Here are Galalith and Catalin sets in the "Staunton" design, which are quite old and interesting. Galalith and Catalin are old plastics which hardly, if at all, have been produced after WWII. Galalith could not be formed in moulds, so the pieces are turned and carved by hand. Catalin required every piece being individually cast and polished, which became too expensive at the end of WWII. The first set is of Galalith. It is interesting, because the board can be folded and put over the box in order to close it. There is a difficult to read logo at the closing flap of the board. There are, in a circle, a big combined "R" and "M", another big "M" and "URIE" as well as the word "PATENT". Below the circle it states "APP.FOR". I'm not sure what it means, but it could be RM Murie, maybe the manufacturer, but that is a name unknown to me. It is assumed that Uhlig made the pieces, because they are exactly designed as Uhlig sets like the bone "Staunton". The second set is of Catalin and made by F.H.Ayres. We know the latter, because of equal sets in a cassette with the F.H.Ayres logo. However these pieces have characteristics of the Uhlig sets. Maybe the pieces were made by Uhlig as well. The "Grays of Cambridge Silette Chess" in Catalin is based on "Staunton". England, by Grays of Cambridge, "Silette Chess"
Even plastic sets from the 50ies are interesting, as the set with the plastic box proves. There exists a matching board, but at my set the board is of perspex (I think) and of later date (I think). 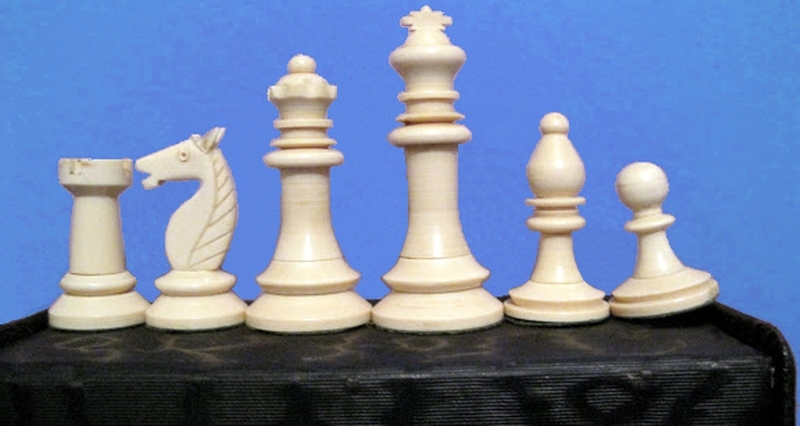 The later House Martin chess set is a cheap, hollow plastic, "Staunton" set. England, by House Martin, "Staunton"